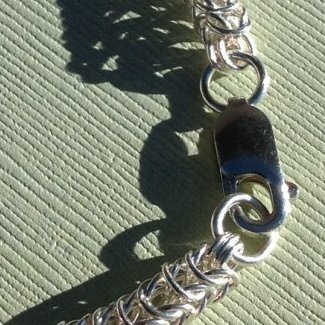 Unlike many artisan chain bracelets, this silver bracelet is made from fine silver wire for a petite and beautiful appearance for all outfits. Fine jewelry! Sometimes you want a showy piece of jewelry, and sometimes you want a more subtle accessory, and this one is perfect for those times. 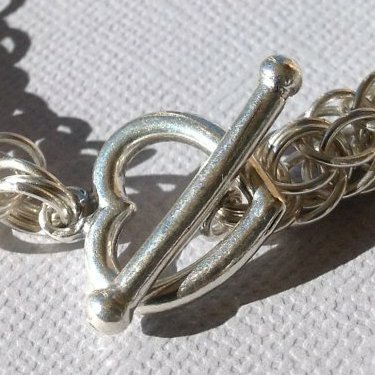 I have always loved making chain jewelry with fine silver wire and very little rings, but, wow, they take a long time to make–so many rings to weave per inch. But the result is worth it. Beautiful and classy. I’m really happy with this jewelry design. 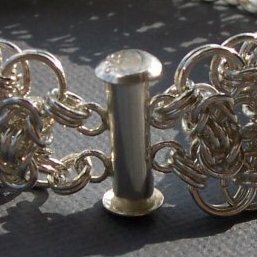 Very few chain mail jewelers will work with rings this size because it is hard to do well and takes a long time. Also, most jewelry makers buy their rings, and very small rings are rarely available. However, I make my own rings for chain jewelry, so I can make rings this size. The result is an uncommonly attractive piece of jewelry. You will love it. I have a heavy version of this fantastic bracelet as well. See the Heavy Box Chain in SILVER and in GOLD FILL.